- tropical, hot all year round but with a dry season, usually of short duration, in both the areas to the north and south of the Equator. The dry season occurs in opposite periods, from December to February (i.e. the boreal winter) north of the Equator and from June to September (i.e. the austral winter) south of the Equator. The rains occur in the form of downpours or thunderstorms (actually, Congo is the country that receives the greatest number of lightning strikes in the world), usually in the afternoon, all year round in the equatorial zone, and in the long rainy season in the two tropical areas. The amount of sunshine in much of the Democratic Republic of Congo is not very good because the strong solar radiation often causes cloudiness during the day, most likely by noon and in the afternoon. On the other hand, because of moisture evaporating from the ground, mists often occur in the early morning, while on the coast, fog and low clouds often form because of a cool sea current. The situation is different in the southernmost part (see Lubumbashi), where the dry season is more pronounced, and during the austral winter (May to September), the sky is often clear. In any case, the sun at the Equator is very strong, and requires adequate protection even when the sky is cloudy, especially at high altitudes. 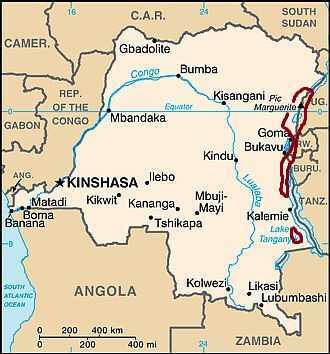 The country is largely occupied by the huge basin of the Congo River and its tributaries. Most of the country is located at an altitude between 300 and 800 meters (1,000 and 2,600 feet), which are often sufficient to temper a bit the climate; in some areas, such as the southeast, the altitude is between 800 and 1,300 meters (2,600 and 4,300 feet), while in the easternmost part, near the Rift Valley lakes, there are also high mountain ranges. In the equatorial zone, temperatures are stable throughout the year. Here are the average temperatures of Kisangani, located near the Equator, 400 meters (1,300 feet) above sea level. The rains in the equatorial zone are abundant, and hover around 1,700/2,000 millimeters (67/78 inches) per year. There are two maxima in rainfall, at the two zenith passages of the sun (that is, when it shines directly overhead in the sky at mid-day, which occurs in late March and late September), and given the soil thermal inertia, the rainiest months are usually April-May and October-November. The least rainy periods are generally January-February and June-July, when, however, more than 100 mm (4 in) of rain usually fall per month. This is the average rainfall in Kisangani. In Kisangani, the amount of sunshine is not very high; however, the sunniest period is the relatively dry one of January and February. Here are the average sunshine hours per day. Both to the north and the south of the equatorial zone (respectively, zone 1 and 2 on the map), the climate is tropical, since there is a clear dry season. The rainfall in the tropical climate zones averages normally between 1,000 and 1,700 mm (40 and 67 in) per year. Also, the temperature varies to a greater extent, and it's lower in the winter dry season and higher in the summer rainy season, but especially in spring, at the end of the dry season. Here are the average temperatures of Gemena, in the north-west (zone 1), at 400 meters (1,300 feet) above sea level. In Gemena, 1,650 mm (65 in) of rain fall annually, with a maximum in the period from August to October. The dry season is short and lasts from December to February, a period when some showers are still possible. Here is the average precipitation. In Gemena and in the north, the sun shines a little more often in the dry winter period than in the rainy summer period. In the tropical zone of the southern hemisphere (zone 2), both temperature and rainfall follow a reversed pattern. 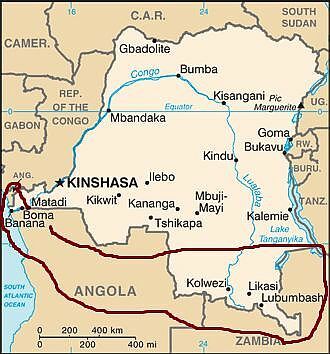 The capital, Kinshasa, is located in the west, at about 300 meters (1,000 feet) above sea level, and at 4 degrees south latitude. Temperatures are high and fairly stable throughout the year, but in the austral winter (June to August) they become more pleasant. Here are the average temperatures. Rainfall in Kinshasa amounts to 1,400 millimeters (55 inches) per year. Within the rainy season, from October to May, you can notice the two peaks corresponding with the zenith passages of the sun (in April and November). Here is the average precipitation. In Kinshasa, the sun does not shine very often: the average does not go beyond 4/5 hours of sunshine a day, all year round. Along the short coastline overlooking the Atlantic Ocean, rainfall drops below 1,000 mm (40 in) per year because of the Benguela current, which in winter arrives in the area and is able to inhibit the formation of rain clouds; on the other hand, the cold current is able to bring a bit of cool air, and to create fog and low clouds. Here are the average temperatures of Banana, located on the coast. In this area, rainfall amounts to as low as 800 mm (31.5 in) per year; the rains are not particularly abundant, except maybe in April. In the austral winter, because of the cold sea current, it never rains. Here is the average precipitation. On the coast, the sun does not shine often in the rainy season, while in the cool and dry period, owing to the aforementioned fogs and low clouds, it shines even less frequently. The sea temperature is high in the summer months, while it becomes a bit cool in winter, when it drops to 22 °C (72 °F) in July and August. However, this coastal stretch, apart from the socio-political conditions of the country, does not lend itself to beach tourism because of the frequent cloud cover. 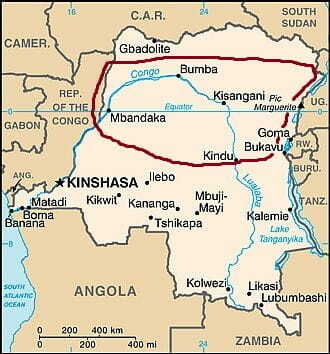 The Democratic Republic of the Congo is more extended to the south than to the north of the Equator (it stretches from the 13th parallel South to the 5th parallel North), in addition, in the south, there are some areas located at higher elevations. The result is that the austral winter is more pronounced in some areas, where it is dry and sunny, but also very cool or even cold at night. 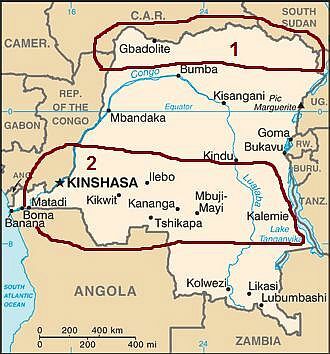 Lubumbashi is located in the far south, in the former province of Katanga, at 1,300 meters (4,250 feet) of altitude. Here, in winter (June to mid-August), the temperature at night can drop to as low as 0 °C (32 °F). Additionally, the temperature increases in the second half of the dry season, between mid-August and October. Here are the average temperatures. In Lubumbashi, the winter dry season is very evident (it practically never rains from May to September) and long (it lasts more than six months). Precipitation amounts to 1,200 mm (47 in) per year, with a maximum in summer (December to February), when the rains are abundant and exceed 250 mm (10 in) per month. Here is the average precipitation. In Lubumbashi and in the far south, the sun shines regularly in the dry winter season, especially from May to September. In the easternmost part of the Democratic Republic of the Congo, there are mountain ranges, related to the East African Rift. In the Rift, we also find a number of lakes, such as Lake Albert, located at 615 meters (2,000 feet) above sea level; Lake Edward, at 915 meters (3,000 ft); Lake Kivu, at 1,465 meters (4,805 ft); Lake Tanganyika, at 770 meters (2,500 ft); and Lake Mweru, at 920 meters (3,020 ft). The mountains have an influence on precipitation: the western side is more rainy, while the eastern side is sheltered from humid currents, so much so that in the central and southern part of Lake Tanganyika, the rainfall drops below 1,000 mm (40 in) per year. Here are the average temperatures of Goma, located at 1,500 meters (5,000 feet) above sea level, on the shores of Lake Kivu. Although we are at the Equator, at this altitude, temperatures are pleasant all year round during the day and cool at night. Rainfall in Goma amounts to 1,250 millimeters (50 inches) per year; from June to August, the rains are fairly rare and not abundant. Here is the average precipitation. In Goma, the sunniest period is the relatively dry one which goes from June to August. 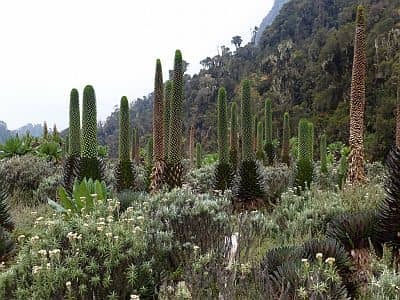 The most imposing mountains of the country are the Ruwenzori mountains, which are located in the far east, on the border with Uganda, almost at the Equator. The highest mountain is Mount Stanley, in Margherita Peak, 5,109 meters (16,762 ft), where there is also a glacier. These mountains are very wet, since they receive constant rainfall and are often covered with clouds; they are home to a variety of environments, which change with altitude: between 2,000 and 3,000 meters (6,600 and 9,800 ft), there is a montane forest; above 3,000 meters (9,800 ft), there are species which are able to withstand the frost at night as well as the strong solar radiation during the day; finally, above 4,000 meters (13,000 ft), we find a moorland similar to the Alpine one. The Ruwenzori Mountains on the Congolese side are protected in the Virunga National Park (which is also a World Heritage Site by UNESCO), which extends to the south, beyond Lake Edward, to the other imposing mountain range, still on the border with Uganda, precisely the Virunga Mountains. West of Lake Kivu, we find the Mitumba Mountains, whose highest peaks are Mount Kahuzi, 3,308 meters (10,853 ft), and Mount Biega, 2,790 meters (9,154 ft). They are part of the Kahuzi-Biega National Park, a UNESCO World Heritage Site, which, however, has been declared at risk because of illegal hunting and poaching. South of the Virunga Mountains are the Itombwe Mountains, which culminate in Mount Mohi, at 3,475 meters (11,401 ft). There is no single best time to visit the Democratic Republic of the Congo, in fact, the dry season comes at different times: in the tropical region north of the Equator, it runs from December to February; in the tropical region south of the Equator (see Kinshasa), it goes from June to August; in the southernmost area (see Lubumbashi), there is little rain even in May, September and October, although in the latter two months, it can get hot during the day, especially below a thousand meters (3,300 feet), for instance, in the Kundelungu National Park. In the equatorial zone, where it rains throughout the year, there is usually a drop in rainfall in two periods, January-February and June-July. In the equatorial zone, all year round, bring light clothing of natural fibers, a light sweatshirt for the evening, and an umbrella or a light raincoat for the rain showers. In the tropical areas, in the rainy season, bring an umbrella or a light raincoat for the rain showers; in the relatively cool dry season (December to February in the north, June to September in Kinshasa and in the south), you can add a sweatshirt and a light jacket, especially in the south and on the coast. At low-mountain elevations, above a thousand meters (3,300 feet, see Lake Kivu and Goma, Lubumbashi), you can bring a sweatshirt and a light jacket for the evening, all year round. In the far south, above a thousand meters (3,300 feet, see Lubumbashi), from May to August, you can add sweater, a warm jacket and a hat for nights and early mornings. For the highest mountains, such as the Ruwenzori, all year round, winter clothes, a jacket, a hat, gloves.